Rhynchosaurs had beak-like mouths that they would have used to lop the tough plants of the Triassic, probably seed ferns. They were an important group of herbivores but died out during the Late Triassic mass extinction. Staurikosaurus (Southern Cross reptile) was small and agile with a slim body, a long, slender tail, sprinter's legs, and shins longer than its thighs. Its head was large for its size, with sharp flesh-eater's teeth. It probably had short arms with 5 fingered hands, and also 5 toes and is related to the larger Herrerasaurus. Before the finding and the Madagascar prosauropods, Eoraptor, a small theropod was considered the most primitive dinosaur known. Scientists have debated where Herrerasaurus fits into the dinosaur family tree. Some have argued that it is too primitive to be considered either a saurischian or ornithischian. 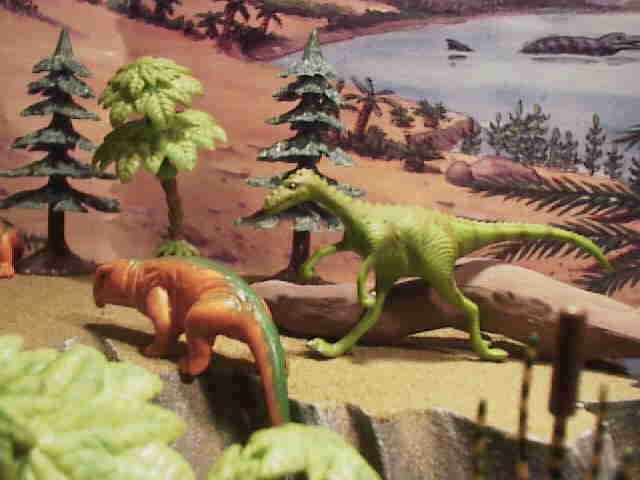 Currently the balance of opinion seems to be that it is an early side branch off the main theropod line. The figures are from a vinyl set that shows up in dollars stores. The indeterminate theropods make a good custom project. Photo and painting from Fred Hinojosa. 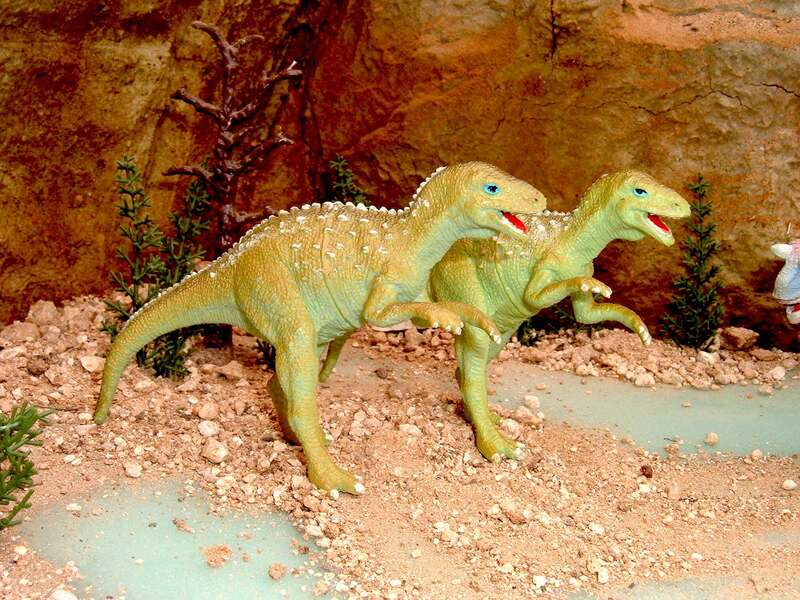 Dinosaurs are neither the most numerous, nor the largest animals from Ischigualasto. A top predator Herresaurus was the first big theropod at 10 feet. Dinosaurs at this time only make up Only about 6% of all tetrapods and have few species. They diversify in the following Norian after an extinction that clears out the top predators. 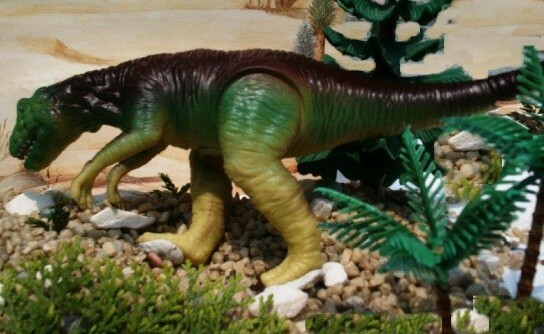 Herrerasaurus from a set of DK paper dinosaur figures.